Seth Troxler, Ryan Crosson, Shaun Reeves and Lee Curtiss, the most innovative and exciting new breed of DJ/producers to come out of the city of Detroit in a generation. Last year their remix of Kiki’s ‘Good Voodoo’ on BPitch Control was one of the summer’s biggest underground hits and together they have released tracks on leading labels like Crosstown Rebels, Spectral Sound, Get Physical, Circus Company, Supplement Facts, Wolf+Lamb, Wagon Repair and Minus. Both individually and together they play regularly at clubs the world over like Fabric (London), Watergate (Berlin), Cityfox (Zurich), Tenax (Florence), Fiesta Privada (Rome), Cocoon (Frankfurt) and Circoloco@Dc10 (Ibiza) as well as holding their weekly ‘Soulshower’ residency at Club Der Visonaere in Berlin. Their Visionquest party at the Old Miami at this year’s Detroit Electronic Music Festival brought together many of the scene’s freshest talent in a spirit of friendship, fun and radical progression, much needed in a scene so easy to stagnate. First up a bit of history... for over two decades the city of Detroit, Michigan has been the home and birthplace of techno. In the mid eighties, inspired by German electronic bands like Kraftwerk and Tangerine Dream, the ‘Bellville Three’ (named after their high school), Juan Atkins, Kevin Saunderson and Derrick May started experimenting with synthesisers and drum machines establishing a musical soundscape that was soon hailed as techno. In the early nineties local African-American DJs like Jeff Mills, Rob Hood and Mike Banks were joined by local white kids, Richie Hawtin and Dan Bell, who experimented with stripping the sound back to its bare essentials creating the early template for minimal techno. A decade later, this inspired Ann Arbor college kids Matthew Dear, Ryan Elliott and Hawtin’s friend Magda, to build on this sound, exporting it globally and creating one of dance music’s dominant scenes. While all this was happening house legends like Theo Parrish, Kenny Dixon Jnr and Aaron Carl were defining the Motorcity’s unique and deeply emotive take on house music. 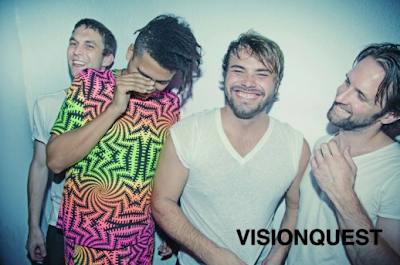 Now comes Visionquest, a new generation of young, talented producers from Detroit who draw influence from all who have come before them, following in their footsteps, while defining a unique sound of their own. Here you have four DJs who have grown up organizing parties and DJing in the city and around the world for the last ten years. Their attention is firmly focused on the deeper soul of quality electronic music, driven by emotion and developed from their very different musical backgrounds. Visionquest have their roots in Motown, draw ambitious spiritual vibes from forerunners like Theo Parrish and Moodyman, deliver the quality of sound and attitude of a best selling Minus record rounded off with the dreamy, otherworldly vibe of the Spectral sound. Matthew Burton & Kate Rathod are the next duo to leave their distinctive mark on the Visionquest imprint. Delivering a deep and dreamy melodic work out with softly fractured beats and reverberating vocals 'The Flip Side EP' is three wintry cuts of understated house music. Influenced by their techno forefathers and favouring analogue gear, the duo's organic production style exudes an improvised quality. Kate says her strengths lie in the melodic side of things, whereas Matthew is more about creating the groove but whether you're witnessing the unique sound they make through this EP or their expanding live set, the pair's fizzing musical chemistry is clear. 'The Flip Side EP' perfectly encapsulates this raw sound padded with soul. From a naked kick and snare, 'Warehouse Fool' builds with warm pads, melting vocal echoes and spacey FX. The stripped back beauty of restrained hypnotic beats will provide a soothing after-hours soundtrack. 'New Funk' has more dancefloor purpose with its rolling, dirty groove and dynamic synth melodies. In 'Flip Reverse Girl' suggestive vocals coalesce with a casual swinging groove fuelled by deep broken beats. The composition is simplicity at its finest, an entirely self-possessed sound that strikes a chord with its atmosphere, jamming feel and wry sensuality. Long-term partners turned collaborators Matthew Burton and Kate Rathod have been producing music together for around 3 years, collecting various hardware synths, instruments and effects, which allows their sound is continually evolve. Matthew has been in electronic music for the past decade and worked with Connect Four, Retrofit and Leftroom, also giving Sammy Dee's Ultrastretch label its first release. Kate came to dance music a little later after meeting Matthew in 2007. After an acclaimed RA podcast, collaborative releases on Retrofit and Organic Art Movement and now Visionquest, Matthew and Kate's live act will continue grow their burgeoning set of fans.